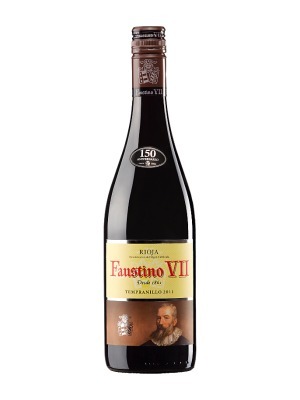 Faustino VII Rioja is a popular Spanish Red Wine available from Tesco Groceries in 75cl to buy online. Visit Tesco Groceries for the best price for 75cl of Faustino VII Rioja or compare prices on our other Spanish Red Wine products. Four generations and 150 years worth of experience go in to insuring that this Tempranillo from Faustino is created to the highest standards. Ageing for 4 months in American oak barrels gives this wine a fruity finish the works well with barbecues and stews. Where to buy Faustino VII Rioja ? Faustino VII Rioja Supermarkets & Stockists. You can buy Faustino VII Rioja online in most retailers and find it in the Spanish Red Wine aisle in supermarkets but we found the best deals online for Faustino VII Rioja in Tesco Groceries, Tesco Wine, TheDrinkShop, and others. Compare the current price of Faustino VII Rioja in 75cl size in the table of offers below. Simply click on the button to order Faustino VII Rioja online now.